Julie Carr’s ability to convey the raw emotion of despair taps into a universal experience of suffering and loss. The poet interweaves thoughts about her own pregnancy throughout the text, while also drawing parallels between her own faulty recollection and Sarah’s fractured memories. According to Carr, her account of her mother’s deterioration was influenced by L=A=N=G=U=A=G=E poets such as Lyn Hejinian, as well as Emily Dickinson and Gerard Manley Hopkins. This book contains many wonderful poems and surprising uses of language, such as the superb “Lines of Refusal,” in which the narrator commands, “Must avoid rivers, strivers, and voyeurs.” While the poems are often quite abstract, Carr grounds the reader through the repetition of tangible images from everyday life such as birds, dirt, water, and sky. When the book succeeds, the opacity of the three forms she employs—the fragment, the line, and the abstract—allows us to see ourselves reflected in the verse. For example, “Waiting Abstracts” encourages contemplation of the effect that cell phones and longing have on our own perception of the universe. In a present day application of Charles Olson’s “Projective Verse,” Carr approaches the page as a blank canvas in an effort to compose her abstracts in the same manner as painters Jackson Pollock and Mark Rothko. Like all abstract art, the results of this approach are uneven. There are thrilling turns of phrase, such as the tight internal rhyme of “the archivist whirls the unfurling losses” and great images: “A bit of food on the floor of her thoughts.” However, there are also poems like “Supposition,” which begin strong but fall flat in their final moments. Some of the experiments remain just that. The infectious formality of the music in “Four Syllable Lines (Monody)” fizzles about two-thirds of the way through, an avoidable problem for a piece that is less than a page long. One is left to wonder whether the small group of poems that simply end—and in rather unstatisfying ways—are weak poems or were instead meant to reflect the elusiveness of memory. If the latter was Carr’s intent, she has sacrificed aesthetics for the sake of artifice. had to give up the meaning of words. And then water. Interestingly, the prose poems (“Inward Abstracts,” “Broken Abstracts,” “In the second week of solid rain . . .”) are the most cohesive pieces in the book. They feel complete in a way that some of the others do not. There is a whispered quality to many of the best lines, as if a secret is being shared. Indeed, Alzheimer’s is a condition that many sons and daughters must face alone. One whose life has not been touched by such a dramatic change in one’s loved ones cannot appreciate the solitude and despair experienced by those who care for their beloved family members as they slip away. This ignorance, however unintentional, leads family members of Alzheimer’s patients feeling alone and shamed. 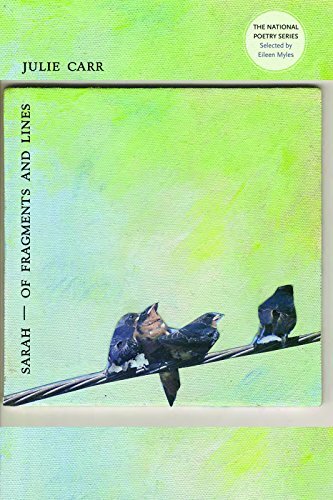 Despite a few failed experiments, overall Sarah—Of Fragments and Lines successfully transforms everyday objects and survival methods into thematic emblems of memory, motherhood, and loss. As Carr points out in the book’s final poem, “Without memory there is no appearance of now.” Just as Sarah cannot escape “this torrent” and finally “dissolves,” the book ends with ellipses. Sarah’s memory, and by extension, her life, does not return. Now never arrives. Christopher Luna is a poet, artist, and editor. He is also the co-founder, with Toni Partington, of Printed Matter Vancouver, a small press and editing service. His latest book of poetry, To Be Named and Other Works of Poetic License, is an art book created in collaboration with David Madgalene and Toni Partington. His book reviews have appeared in The Pedestal Magazine, The Oregonian, and Rain Taxi Review of Books.